For Team Dimension Data for Qhubeka and Tyler Farrar the day lived up to the pre-race hype, being a non-stop drama filled race. The team’s goal for the race was clear: to support Edvald Boasson Hagen for the win. It took just over an hour for the first break away to stick. For the first 2 hours, Farrar who was in the peloton averaged 44kph with a Normalized Power®(NP®) of 289W, average power 235W. This period of relative calm was a prelude to the notorious seven Pavé sectors and 18 hellingen. Farrar’s job was to place Boasson Hagen in the best possible position leading into the crucial cobble and hellingen sections of the race. Unfortunately, Farrar crashed on the downhill just after the Eikenberg at roughly 47kph. “I hit the ground really hard. I managed to keep going and chased for 40km to get back to the peloton so that I could lead Edvald out for the second lap up Oude Kwaremont”. During this 40km chase period, he averaged 335W Normalized Power for an hour, and rejoined the peloton as they were approaching the Valkenberg. Farrar’s uncompromising commitment to his team mate and designated race day role ensured that he positioned Boasson Hagen into the Oude Kwaremont in almost leadout fashion, when the race featured the climb for the second time. 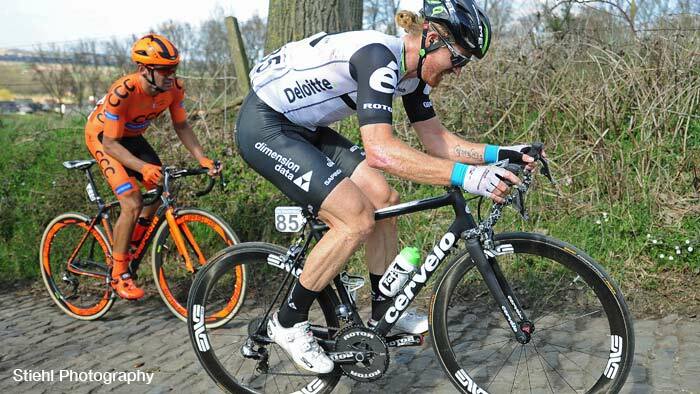 Farrar did 5 maximum efforts of 900-1000W within the last 3kms leading up to the Oude Kwaremont. View Farrar’s full ROTOR power file.